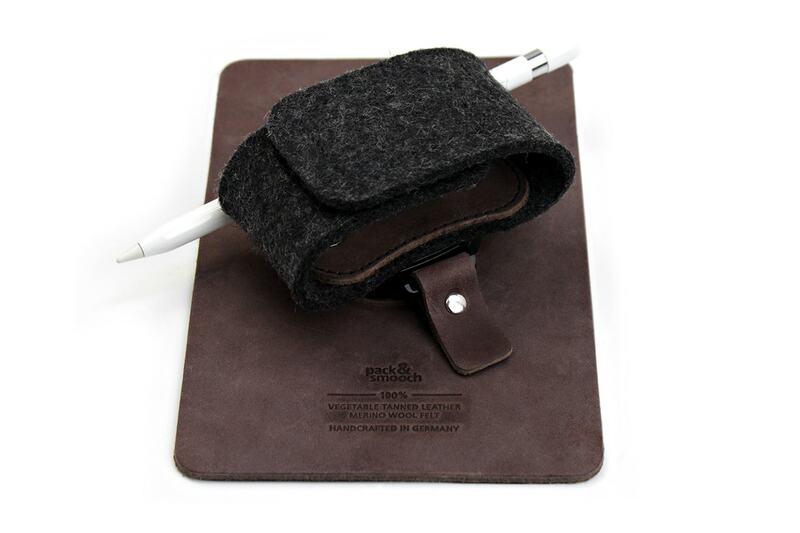 Product information "Tabstrap - iPad holder, iPad hand strap"
Get a grip on your iPad: You'll love it! 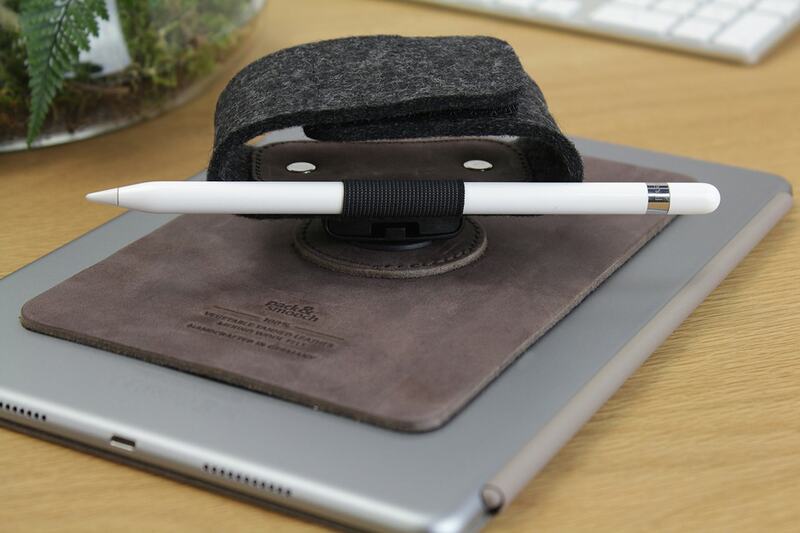 TapStrap is the Houdini of iPad holders. 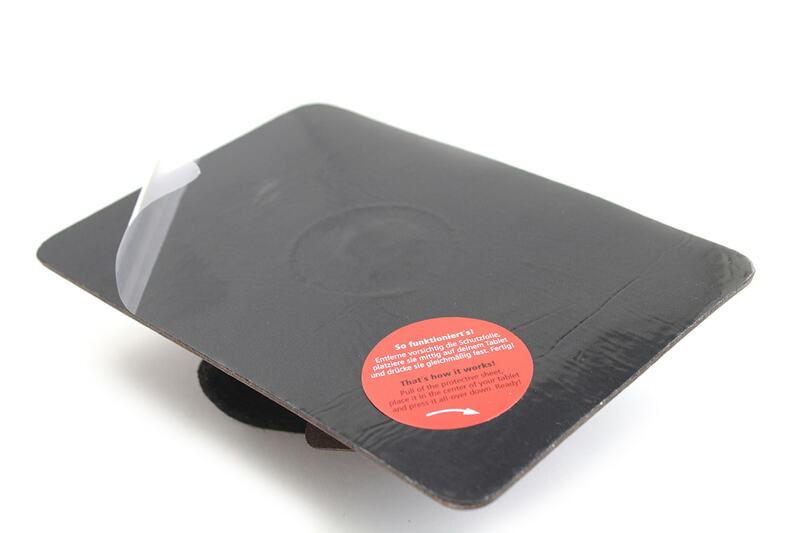 It has magical vacuum powers which hold the iPad Stand safely and gently to smooth tablet surfaces. Simply detach and reattach it any time you want. With its sleek look of vegetable-tanned Bavarian leather, the TabStrap is not only a head-turner, it also turns in your hand – 360° of comfortable control. Easy as 1-2-3! 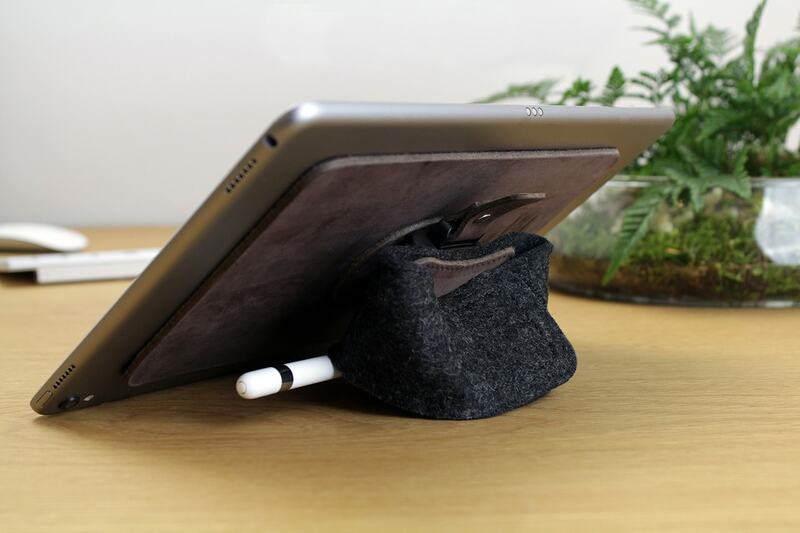 Fasten the strap, fold it, and the iPad stands securely on its own. Wrap it around your wrist and work all day with no risk of tennis elbow. 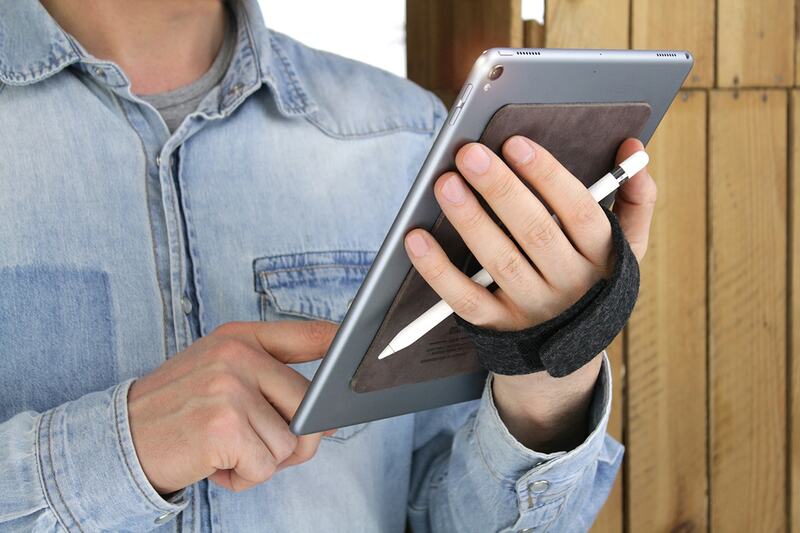 And thanks to the integrated holder, your Apple Pencil is always at hand! Related links to "Tabstrap - iPad holder, iPad hand strap"
Our camera handwrist strap Heidschnucke is easy to clean and care for. If the wool felt becomes slightly soiled, the product can be carefully cleaned with a damp cloth. Heavier soiling can be treated with a mild soap solution and dried with a soft cloth. Small scratches in the leather can usually be gently rubbed out with a damp cloth. Larger scratches can be removed with a little bit of leather wax applied with a soft cloth. 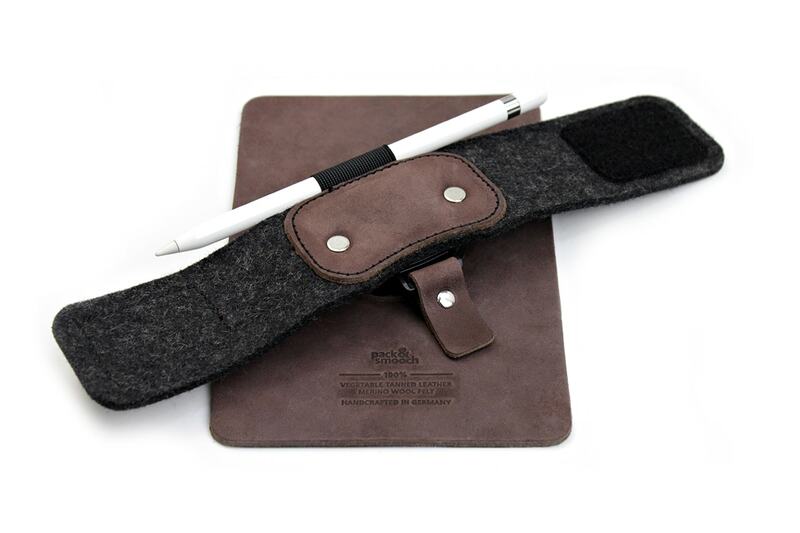 Customer evaluation for "Tabstrap - iPad holder, iPad hand strap"
Es funktioniert großartig! Sehr einfach aufzubringen und hält superfest, die Handschlaufe lässt sich sehr einfach lösen und wieder einklicken, das Pad steht gut mit der eingeknickten Handschlaufe, es dreht sich richtig gut und der Stift hält sehr gut in der Stiftschlaufe. Es sind wirklich die hochwertigsten Materialen handwerklich perfekt verarbeitet. Es ist ohne Abstriche funktional und zudem noch sehr schön. Vielen Dank für diese tolle Erfindung. Ein echt tolles iPad Halter! Guck dich das Video an, es macht genau das was es verspricht!